1. In a general sense, to dress; to equip, but appropriately, to array in a military uniform and weapon: For the costume party in the evening, the two friends accoutered themselves as knights of the 16th century. 2. To equip and to outfit the body for military service: When Robert entered the service with the army, he had to accouter himself with his new uniform before the first roll call. 3. 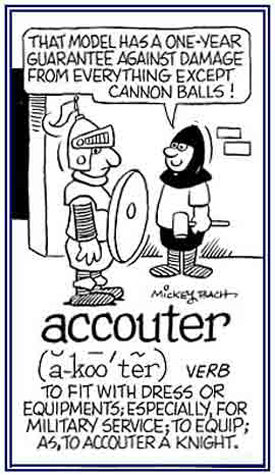 Etymology: from Old French accustrer, "to arrange, to equip"; from Latin a-, "to" + coustrer. "to sew". © ALL rights are reserved.